DON’T STAY WHERE YOU ARE. MOVE UP, IMPROVE, STRIVE FOR THE TOP. BE COUNTED. While Easy Horse is aimed at providing the novice (and in many cases even old time horsemen) with correct basic information on horsemanship, especially training, SMART HORSE is aimed at refining these skills. SMART HORSE discusses various disciplines in detail, making it unique among horse books. The reason for this approach is because every discipline has unique techniques which are virtually unknown to other disciplines. These unknown techniques can be of incalculable value to other disciplines, therefore this unique e-book makes it available in one package. A very complete chapter on the correct balance and seat of the rider. The correct use and position of each body part. This basic information is applicable to any discipline. Detailed information on how to achieve ultimate suppleness in a horse – the exercises. How to correct a horse which is not straight. Getting ultimate flexion and collection, balance, weight on the hindquarters and light on the forehand, and how to sensitize a horse to subtle aids. Discipline specific training of the Piaffe, Pirouette, Passage etc.in complete detailed chapters. How to relax a tense horse. The JUMPER SECTION describes techniques to correct a problem horse, which are applicable to any discipline. The section on SHOWING HORSES IN HALTER CLASSES describes a very broad spectrum of showing foals in halter classes over 53 pages, including the selection of show foals, initial or foundation training, show training, feeding, conditioning, shipping and showing. Contributions by some of South Africa’s top halter trainers of various breeds are included, as well as breed standards of various breeds. The ENDURANCE SECTION describes horse training techniques to prepare the future endurance horse, starting with training which can do the horse no physical or mental harm at 2½ years. These horse training techniques will give you an advantage when your horse is ready for endurance riding. This section offers information which is equally applicable to any horse in any discipline. Basic training to prepare any horse for specialized training in any discipline. These standards, in my opinion, are higher than those of 75% of training standards expected in any discipline, yet they are the foundation of a well schooled horse. Teaching Single Rein Stop – essential for ANY horse. Detailed description of disengaging the hindquarters and forequarters. These manoeuvers are absolutely essential for a well trained horse. How to get an over excited, over keen horse which pushes for home, under complete control. Why backing is so essential and how to apply it to discipline your horse. What to do with a spooky horse. These techniques are priceless for any horse in any discipline – the right and most effective way to deal with it. 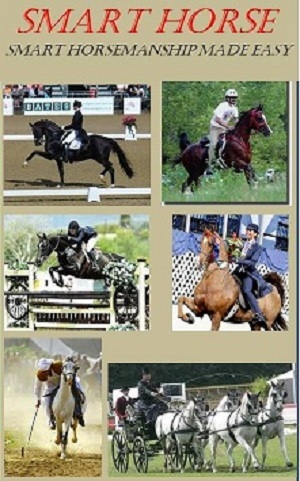 The SADDLEBRED SECTION offers ten pages describing various techniques to obtain flexion and collection. These techniques can be applied to any horse, irrespective of breed or discipline. The TENTPEGGING SECTION gives a thorough explanation of the various items, as well as the history of the discipline. SMART HORSE has been developed to give horsemen across the entire spectrum the opportunity to learn from each other. In this way it may be an unique encyclopedic volume.